One of the fun things that happen during the summer is the lightening bugs come out in full force. It's a beautiful sight to see a field with their blinking bodies. This is was the inspiration behind the project we have for you today, which was created with our glass jar template. I'll let the talented Dana explain her process to you in her own words. Hi! 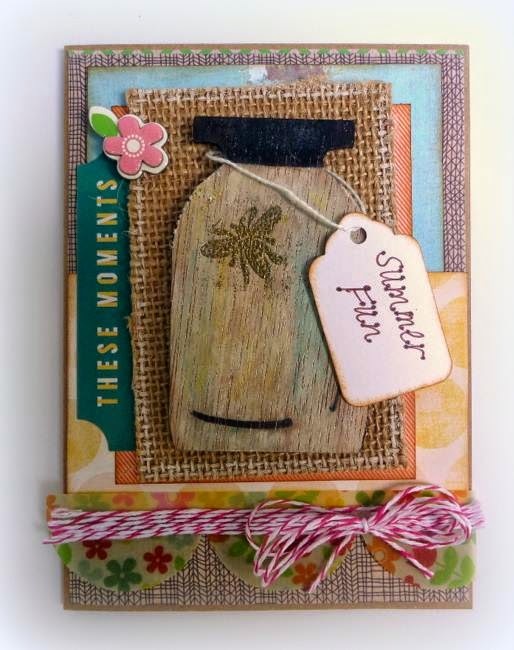 Dana Tater here today sharing a card that I created with the JnW Crafts Wood Mason Jar Embellishment. My girls have a blast trying to catch lightning bugs just after dark. When I saw the JnW Crafts jar embellishment, I immediately thought of them running and laughing through the yard with their friends, chasing flashes of light. I designed this card after a similar card created by the mega talented Andrea Budjack. I colored the wood with Gelatos, using just a tiny bit of water and my finger to blend the color for a transparent glass look. I used a black marker to add some detail and to color the top of the jar. I used gold embossing powder and a stamp to add the lightning bug to the jar. I then seal the top of the embellishment with glaze. Thanks for stopping by today! Visit our store for this embellishment plus many others. You can visit Dana at her blog.